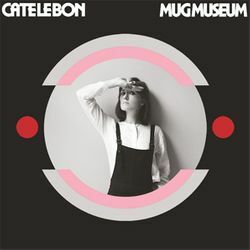 Welsh singer-songwriter Cate le Bon produced one of our favorite, underappreciated (well, by those who didn’t hear it) albums of 2013 with Mug Museum. Blending the cool demeanor and husky voice of someone like Nico with jagged post-punk guitars and beats, Mug Museum sounds like a hard-to-place unearthed precious relic, like something whispered into your ear. 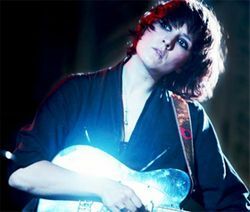 She’ll perform at Amoeba Hollywood April 30 at 7 p.m. Before the show, we caught up with le Bon, who recently moved to L.A.
What spurred your move from Wales to Los Angeles? I have always been intrigued by Los Angeles ever since coming to the city to rehearse with Neon Neon way back when. When the opportunity presented itself to record an album out here, which has always been a dream of mine, it felt like it was time to bite the bullet. Money mouth etc. ...The weather is also a definite perk. I read that you wrote most of the album in your home country, but I do feel a bit of SoCal sunshine poking through in Mug Museum. Do you think the new locale affected the sound of the album? It has most definitely seeped into the album, but how, I am not able to say yet. I think that will become apparent to me when I listen back in many years. It has to be a huge change. How do you feel playing and recording music here differs from doing so in the U.K.? I am utterly gutted to hear that Huell Howser has passed away. I heard the news as I was writing about my exploration of Irvine for this blog, and simultaneously planning on exploring the route of the Expo Line Phase II tomorrow. If it weren’t for Huell, I may not have had the idea of doing either. (When I was approached about working for KCET, one of the names I proposed was California's Fools Gold, a self-deprecating homage -- they went with Block By Block instead). I’m sure he inspired a lot of other people to go on adventures in their back yards too (this page has a map showing the communities he visited). Even though I never had the pleasure of meeting him, I will miss him terribly. Back in November, Huell announced that he was retiring amid rumors that he was seriously ill. Just last week I was chatting about him with a customer at my shop and the customer expressed his dismay. I too was saddened by his retirement but expressed that he'd earned it and that even his biggest fans have, in most cases, hundreds if not thousands of episodes to catch up on. Still, the customer hoped that someone would soon fill his shoes. I expressed doubt that any single person could. It's impossible to know how many adventures Huell Howser inspired. I suspect that he's one of John Rabe's biggest heroes. (Check out Rabe’s episode with him here). I loved his earnestness, enthusiasm, unpretentiousness, boundless sense of adventure, energy, and intelligence. Despite the fact that Angelenos are constantly told that we are obsessed with celebrity, glamour, fame and fortune; Howser showed thankfully little interest in any of that. He even seemed to hint at a healthy disgust with politicians and ambivalence for authority. Instead he championed the everyday, the immigrant, the ignored, the uncelebrated and in doing so showed what really makes California truly special. While I caution anyone attempting to make generalizations about a group as diverse and large as the 13 million or so people known as “Angelenos,” I have nonetheless made a couple of observations about a much smaller subsection, my Los Angeles friends, that I have to assume share more widely-held views with Angelenos with whom I'm not personally acquainted. Just one example; as far as I can tell, only in Los Angeles do people say things like “only in LA” about things that happen pritnear everywhere. In this entry I'd like to address and reflect upon another completely nonsensical but widely held view – that Los Angeles (and presumably at least the entire Southland and possibly all of SoCal) has no seasons or weather. As far as most people are concerned, temperatures in Los Angeles are usually quite pleasant. The daytime average is 24 °C (75 °F). The warmest days rarely exceed 32 °C (90 °F) and rarely dip below 15°C (59 °F). When temperatures deviate from this narrow comfort zone, legions of thoroughly-spoiled (and acclimated) complainers express their indignation on various social media and to their friends. As someone who has truly suffered through 48 °C (118 °F) heat and -42 °C (-44 °F) I have little sympathy for our weather whiners -- we have it so easy!